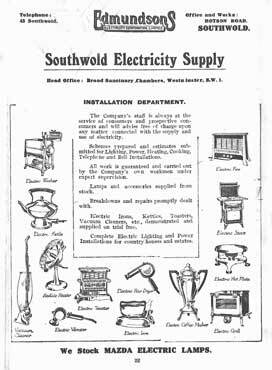 Edmundsons, Southwold Electricity Supply- a national electrical supply company, have taken over the town's electricity supply this year following a fire which destroyed the repair shop of the Southwold Electric Lighting Board in 1919. H A Clarke - Manager Southwold Electricity Supply Company. 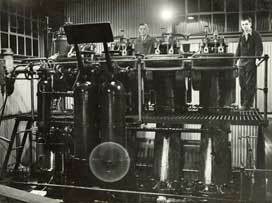 Southwold Electricity Supply Company.- When did it close? Duncan & Son - Building Contractor. The company has acquired the freehold from Adnams. The company was founded in 1973 and has moved here from No 5 Mill Lane. 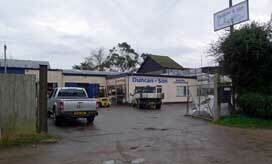 It is run by founder Mungo Duncan who has worked on this site before as Manager of William Denny & Sons. He is partnered by his son, Brian, and daughter, Pauline. Mark Aldred - becomes MD following the retirement of Brian Duncan this year. Mark is Brian's nephew. A 1901 bill head in the Southwold Museum collection. 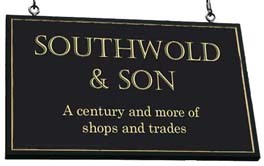 Adverisement in the 1922 Southwold Shopping Week programme. The address is given as in Hotson Road whereas today iit is considered to be in St Edmund's Road. 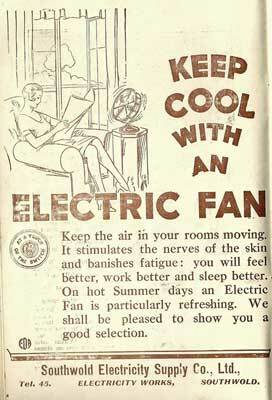 1929 advertisement in the Wesleyan Church Guide. Image kindly supplied by Heather Osmer. Click the advertisement to enlarge. 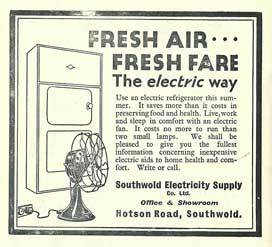 1930 advertisement in the Southwold Magazine. King George V's Silver Jubilee 1935. 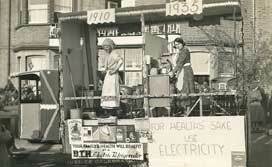 Southwold Electricty Supply Company celebrated with this carnival float dramatising the transformation of the domestic kitchen over 25 years.. Image from the late Robert Palmer postcard collection, reproduced by kind permission of his mother, Margaret.